I've had the ARC for The Lucy Variations by Sara Zarr (Little, Brown and Company), which came out sometime in May (aka that month that I was swamped with work), for a while now. I've finally found a sliver of time in my schedule to type up a review for it so here it goes! 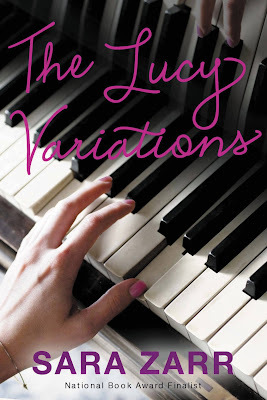 The Lucy Variations follows the story of sixteen-year-old Lucy Beck-Moreau, former concert pianist. She's lost her former fame and certain future all before fourteen, when a tragedy hits. Now, she's just another girl going to high school. Lucy's brother, Gus, however is left to carry what used to be Lucy's job-- meeting family expectations. However, one day when Gus' new piano teacher arrives and wants to help Lucy rediscover her love for piano, Lucy starts to find joy on her own terms and discover who she really is. The chapter titles are all musical terms, which I loved. I used to play piano (and violin but that's another story for later) and it was quite a throwback for me to see musical terms. It was a creative touch. However, for the story itself, I was disappointed. I connected with Lucy in the way that I could understand having to meet family expectations that are set higher than most families but that was it. Lucy had a strange obsession/crush on older men (ie. her English teacher) and it was... weird. Lucy's friends didn't really understand her either, which is problematic since I connected more with the friends than the protagonist. It wasn't like a "Oh I have a crush on you because you're cute" kind of crush; it was more of a "I like everything that you stand for and the type of person you are so I'll get a muffin for you in the morning" kind of crush. Later in the book, Lucy developed a crush on her brother's piano teacher, which I suppose is the one of the "intense mentorships" that's described in the synopsis. Needless to say, I couldn't connect either. The Lucy Variations had promise but it was the way that things were described and Lucy's own personality that really made me dislike The Lucy Variations. I liked the premise of "one girl's struggle to reclaim her love of music and herself". Lucy's had piano in her entire life and to have that taken out, she's obviously going to struggle with her identity (how do you separate something that's been part of your life for so long that it becomes your identity? ), no doubt. But the way that her discover hinged on a piano teacher (who's married, nonetheless) and the way that the mentorship turned more into a romantic interest (or that's how it seemed to me) than a mentorship was weird. I really do wish I could say that I loved The Lucy Variations but I can't. Perhaps I'll love the next music-related book I come upon. It's unfortunate that you couldn't relate to Lucy and that she seemed to have so many unhealthy relationships. Lucy's actually 16 in this but it's not too different from being 14, I think.